The London Palladium (/pəˈleɪdiˌʊm/) is a 2,286-seat Grade II* West End theatre located on Argyll Street in the City of Westminster. From the roster of stars who have played there and many televised performances, it is arguably the most famous theatre in London and the United Kingdom, especially for musical variety shows. The theatre has also hosted the Royal Variety Performance a record 40 times, most recently in 2014. From 3 September 1928, the Palladium reopened under the directorship of the impresario/producer George Black as part of the General Theatre Corporation (GTC). When Black took control the theatre was close to bankruptcy. He revived its fortunes by returning to the original ethos of the Palladium by staging large variety shows, with a capital 'V' - and as well as headlining Britain's homegrown acts he brought over big American stars such as Duke Ellington and his Orchestra, Adelaide Hall, Louis Armstrong and Ethel Waters for two-week engagements. Before too long, under Black's management the Palladium was soon gaining praise again as 'The World's Leading Variety Theatre'. In 1935, Black initiated the Crazy Gang revues at the Palladium (for which he is chiefly remembered) with Life Begins at Oxford Circus. 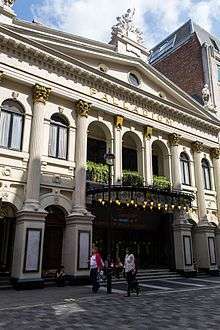 The revues continued at the Palladium as an annual event until they transferred to the Victoria Palace theatre in 1940. Black managed the Palladium until his death in 1945. The theatre was hit by an unexploded German parachute mine on 11 May 1941. The device had fallen through the roof, becoming lodged over the stage. A Royal Navy bomb disposal team was sent to deal with it. After the mine was located, the fuze locking ring had to be turned to allow access to the fuze itself. Rather disconcertingly, the fuze began ticking as soon as it was touched. This caused a rapid evacuation of the immediate area, but the mine did not detonate. The two team members cautiously returned, extracted the fuze and removed other hazardous components, rendering the mine 'safe'. It was then lowered to the stage and disposed of. The George Medal for gallantry and undaunted devotion to duty was given to Sub Lieutenant Graham Maurice Wright for his action in the Palladium on that night. He was later killed, on 19 Aug 1941, while en route for Gibraltar on board the torpedoed troopship SS Aguila. Val Parnell took over as Managing Director after George Black's death in 1945. He adopted a controversial, but very successful, policy of presenting high-priced, big-name American acts at the top of the bill. Among many, the list included Carmen Miranda, Judy Garland, Sophie Tucker, Bing Crosby, Danny Kaye, the Andrews Sisters with Vic Schoen and his orchestra, Bob Hope, Liza Minnelli, Ella Fitzgerald, Frank Sinatra, Sammy Davis, Jr., Frankie Laine and Johnnie Ray, freezing out many British stars of the day, who were relegated to second-billing. Beatlemania started at the Palladium 13 October 1963. A Johnny Cash album was recorded there in 1968, but Columbia Records never released it. Bootlegs of this performance are circulating, though. In 1970, the Palladium attempted to get Elvis Presley to perform 14 shows over a period of seven days. When Presley's manager, Tom Parker heard that the theatre was offering Presley 28,000 dollars, he reportedly said "That's fine for me, now how much can you get for Elvis?" Had Presley performed, it would have been his first overseas performance. Presley never performed outside of North America due to Parker's lack of a passport. In 1981 the cellars of the Palladium housed a waxworks museum, aptly called "The Palladium Cellars". Headlined by a Yul Bryner live projection automaton, (as the king from the long running "King and I, (also starring Virginia McKenna)). The museum failed by design as a £4 million tax loss that stacked through Stoll Moss group saving them tens of millions in taxes. Early 80s acts included Yul Bryner/Virginia McKenna. King and I. David Essex, flying pickets, Peggy Lee on her last tour of England. Molly Sugden/Jim Davidson in panto. And so on. The London Palladium turned 100 years old on Boxing Day 2010, and a one-hour television special entitled '100 Years of the Palladium' aired on BBC Two on 31 December 2010. Sir Elton John performed at the venue in September 2013 in a special show where he was presented with the Brit Awards Icon, subsequently broadcast on ITV1. Robbie Williams promoted his new album 'Swings Both Ways', the UK's 1000th No. 1 album, with a one-night performance on 8 November 2013 that was filmed for television broadcast (BBC One). He was joined by members of the cast of the Muppet Show (Kermit the Frog, Miss Piggy, Fozzie Bear, Gonzon, Statler and Waldorf), Lily Allen, Rufus Wainwright, his father, a children's choir and a 30-piece orchestra. Invited guest included Adele and One Direction. 2002: Chitty Chitty Bang Bang directed by Adrian Noble and choreographed by Gillian Lynne. The original cast included Michael Ball as Caractacus Potts, Emma Williams as Truly Scrumptious, Anton Rodgers as Grandpa Potts, Nichola McAuliffe as Baroness Bomburst, Brian Blessed as Baron Bomburst and Richard O'Brien as The Child Catcher. 2011: The Wizard of Oz opened at the theatre on 7 February 2011 and played until September 2012. This production was produced by Andrew Lloyd Webber who found Danielle Hope to play Dorothy via the BBC talent show series Over The Rainbow. 2012: Scrooge the Musical, a revival of the 2005 production, starring Tommy Steele, played from October 2012 through January 2013. 2013: A Chorus Line directed by Bob Avian, opened 2 February 2013. closed on 31 August 2013. 2013: The Nutcracker on Ice, a touring production, directed by Tony Mercer, due to open on 24 October 2013, and close on 3 November 2013. 2014: Cats, a West End Revival, which opened 6 December 2014, starring Nicole Scherzinger. 2015: Cats, a continuation of The West End Revival, which opened 23 October 2015, starring Beverly Knight. 2016: Cinderella, the return of the Palladium pantomime after 29 years, produced by Qdos Entertainment. Opens 9 December until 15 January 2017. Starring Paul O Grady, Amanda Holden, Julian Clary, Lee Mead, Paul Zerdin, Nigel Havers, Count Arthur Strong, Natasha J Barnes, Suzie Chard and Wendy Somerville. ↑ "Listing for The London Palladium". English Heritage. 1972-06-28. Retrieved 2014-10-09. ↑ 'Argyll Street Area', in Survey of London: Volumes 31 and 32, St James Westminster, Part 2, ed. F H W Sheppard (London, 1963), pp. 284-307. British History Online [accessed 10 April 2016. ↑ Hogben, Arthur (1987). Designed to Kill. Patrick Stephens Limited. p. 80. ISBN 0-85059-865-6. ↑ Terrace, Vincent (1980). Complete Encyclopedia of Television Programs (1947–1979). South Brunswick and New York. p. 269. ISBN 0-498-02488-1. ↑ "History of the Society". The Wine Society. Retrieved 17 November 2015. ↑ Archived 18 May 2007 at the Wayback Machine. ↑ "Sir Elton John wins first Brits Icon award". BBC News. 2 Sep 2013. Retrieved 15 Sep 2013. ↑ "A CHORUS LINE Mounts First London Revival Since Original Production, Feb 2013". broadway world. 6 September 2012. Retrieved 14 September 2012. ↑ "Ice rink returns to the London Palladium for The Nutcracker, June 2013". BBC News. 29 June 2013. Retrieved 22 August 2013. ↑ "'I Can't Sing': Harry Hill reveals name of his X Factor musical". express.co.uk. Daily Express. 22 May 2013. Retrieved 25 June 2013.